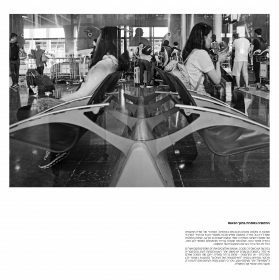 In this photography from the arrival hall of the Charles-de-Gaulle airport main terminal, in Paris, there is a symmetric structure, build from the central axis of the modern bench, and the 2 women sitting back to back, both with clear shirt and dark hair. But what is evident in this black in white print was really not … when in colour. Still now there is a lot of “chaos” all around, other people and elements which seems to occupy a casual place, something out of order. With the colour, there is simply more noise, more distraction, and the central symmetry – or harmony – is less obvious. Maybe this is why a Vilém Flusser (1920-1991) , in his book “For a philosophy of the photography” considers that Black and White photographies are more “real” than colour photographies. Because the colour is sometimes too much a distraction and only add to the veil of illusion.